It has been a couple of months since I first released the Fluent Migrator Class Generator utility. In that time there has been several updates to the Fluent Migrator project on GitHub so this release addresses some of the changes. The first enhancement is an optional Profile setting. 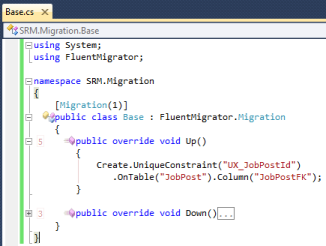 A Profile is a Migration Class Attribute that can be used by the Migration Runner to filter which migrations will be performed. For example, you might have migrations that should only run on the Developer Test Database. See the Fluent Migrator Profile Wiki for more information. The second enhancement is also optional. It is a Tags setting. 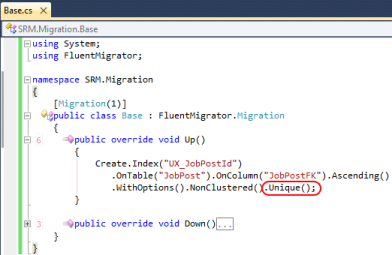 Tags are also a Migration Class Attribute that can be used by the Migration Runner to filter which migrations will be performed. See the Fluent Migrator Tags Wiki for more information. The final modification is a change in the way that unique constraints / indexes are handled. In the previous version the Create.Index expression was used. To be compatible with Fluent Migrator v1.0.3.0, the Create.UniqueConstraint expression must be used. An updated version of this application can be downloaded from http://pfsolutions-mi.com/Product/FluentMigratorClassGenerator. Range – validate whether the value of a property falls between a specified range of values. Regular Expression – validate whether the value of a property matches a specified regular expression pattern. Required – mark a property as required. String Length – specify a maximum length for a string property. The problem is that if you like to design "Database First" like me, it can take a significant amount of time to build all of the classes later. Since I'm the kind of person who hates tedious work, I created my own utility for building the classes called MetaData Class Generator. MetaData Class Generator is a console application for generating Data Annotation classes based on an existing SQL Server Database. This application has only been tested with SQL Server 2008 R2. Other versions may work, but there could be issues mapping newer data types. Be sure to read the README.TXT file for instructions on running the application. Earlier this year at the CodeMash conference in Sandusky, Ohio I heard about a NuGet Package called Fluent Migrator. Fluent Migrator is a database migration framework that uses classes for performing database migrations. Up until this point, the way I typically handled database migrations was to write T-SQL scripts or use a commercial application. 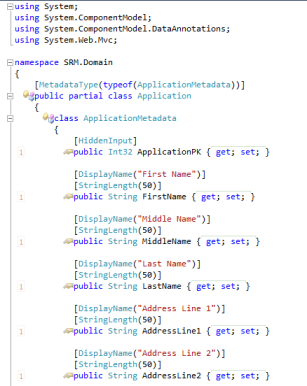 So when I learned that I could accomplish database migrations using simple classes in .NET, I was intrigued. 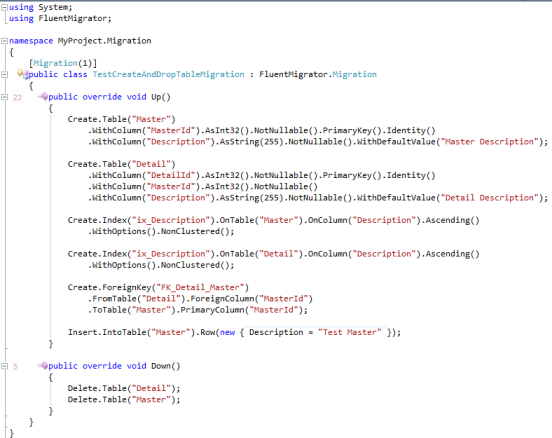 The image above demonstrates how to use a Fluent Migrator class to perform a database migration (create table, create index, create foreign key, etc.). 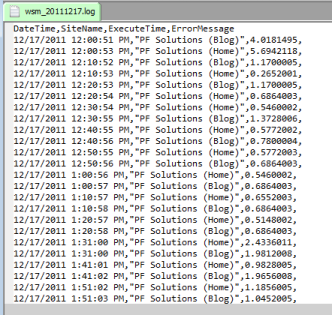 There are also similar expressions for deleting columns, altering tables, altering columns, and etc. I'm not going to go into all the details about how to use the framework. I think there is enough information on the project site to help anyone get started. The one problem I found when using the Fluent Migrator framework is the barrier to getting started when the database already exists. Fluent Migrator does not have any kind of class generate utility that can build the initial class with all of the necessary create schema, table, column, and etc. commands. That means I would have to either use a T-SQL script of the current structure and then use Fluent Migrator classes for any future migrations. Or I could spend a significant amount of time building the initial class myself. Since I'm the kind of person who hates monotonous work and thinking that I would want to use Fluent Migrator for several existing projects, I created my own utility for building the class called Fluent Migrator Class Generator. Fluent Migrator Class Generator is a console application for generating a Fluent Migrator class based on an existing SQL Server Database. Earlier this week I received an email asking if the DSB (DiscountASP.NET SQL Backup) application could do secure FTP transfers. At first I assumed that an SSL certificate would be required, but I did some quick research on the DiscountASP Support Portal anyways. There I found a Knowledge Base Article showing that DiscountASP allows FTP over SSL on all IIS7 accounts. Thinking this would be a great feature, I modified the DSB application to check for the Databases.XML file for a FtpEnableSsl setting. If the setting is “true”, a SSL connection is used for all FTP data and commands. After some quick testing on two PCs, I sent the DSB v1.3 update. Later that evening I received an email thanking me for the change and quick response. It always feels good when someone appreciates your work. The next day, I received an email from the same person stating they were having a problem restoring the backups. They had tried restoring a backup created with DSB v1.3 and an earlier release. In both tests, the restore in SQL Server failed with a "RESTORE FILELIST is terminating abnormally" error message. As everyone should know, it is not a wise idea to backup a system and assume that the backups are good. It is important to periodically test the backups by restoring them. This was something I recall doing when I first created the DSB application. Unfortunately, I had not been repeating the restore test with every new release. So I grabbed my last SQL Server backup, attempted to perform a restore, and sighed when I got the exact same error. After I got over the initial shock, I jumped right into the code and found the source of the problem. In the FTP Download process I was using the wrong class for writing the BAK file to the local disk. I fixed the code, and then retested the entire process (backup, download, and restore) on two different PCs with two different DiscountASP accounts. With everything working on my system, I sent the DSB v1.4 update to the user. The next day I received a response that the backup and restore process were now working on their system. Moving forward, I will be sure to test the backup, download, and restore process with every new release. I will also be researching ideas for how I can notify users of important updates other than relying on this blog. I apologize for any problems this issue causes.